Since Thunder’s launch in 2013, Vuly has been developing another trampoline to add to its suite. They now launch this brand new trampoline, Vuly2, with great excitement. Aesthetically, the connection between Thunder and the new Vuly2 is obvious. Along with the same great style, the two trampolines offer the same premium level of safety, and boast a lot of the same high-quality components. In fact, the net, net poles, and jump mat use the same technology as the very popular Thunder trampoline. 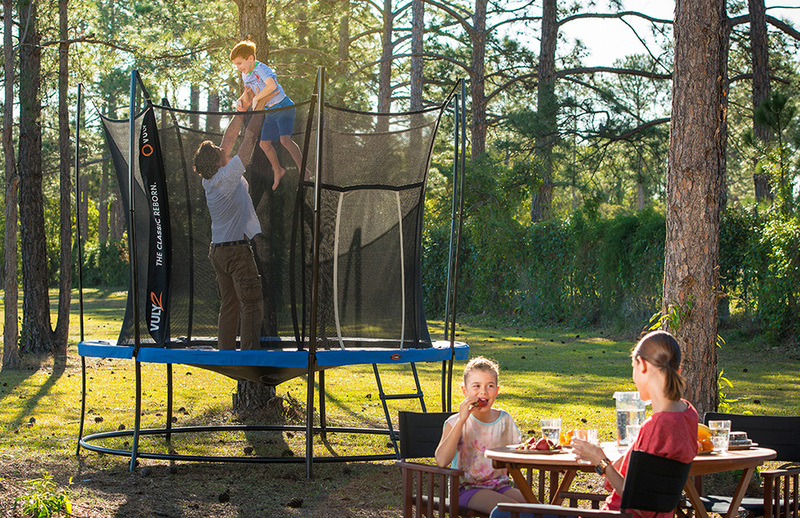 But Vuly2 is not exactly the same as Thunder; Vuly2 is the traditional backyard trampoline, redesigned. “We’ve have taken all of the feedback we’ve received over the last seven years, and applied it to a new design.” Vuly CEO Joe Andon says of the new trampoline. Vuly2’s tapered coil springs, stylish reversible safety pads and easy to assemble components mean that it’s an affordable update to the classic backyard staple you’ve come to know and love. By developing a trampoline that uses the best safety features from both it’s popular backyard trampolines, Vuly was able to create a new favourite that’s equally as safe for your family. A tightly woven trampoline enclosure, extra-thick safety padding and an overlapping doorway mean that bouncers can relax in the knowledge that they’re protected by Vuly’s trusted safety considerations. Unique powder coated and galvanised frame tubes provide an inherent strength that's unmatched by other trampolines - so you can be sure that the Vuly2 will last and last. To add even more fun to your trampoline, Vuly2 has a great range of accessories on offer, including a Ladder, Anchor Kit, Vuly Deck, and Basketball Tent, as well as a new Trampoline Tent. This Trampoline Tent features slanted roof sections that allow water to easily slide off the surface, meaning that you can use the tent in wet weather conditions. Vuly2 is available from October 12, 2014 in Australia, with other international markets soon to follow. Check out its great features and order yours for Christmas at www.vulytrampolines.com/trampolines or call our friendly sales team on 1300 667 514.